There are many things in my life for which I give thanks, but this little guy is something special. Finn was abandoned in rural Arkansas, along with his mom and litter mates, when he was only a few weeks old. Just a few months later, he had become a true Rhode Island dog, discovering the joys of rolling around in washed-up seaweed, the satisfaction of a hard day spent attacking garden hoses, and the benefits of hanging out around the grill when salmon is on the menu. He isn’t the bravest of lions: thunder, fireworks, garbage trucks, balloons, computer power cords, and men with large beards are all good reasons to hide under the bed. He’s really more of a Boo Radley than a Huckleberry Finn, but what he lacks in courage he makes up for many times over in sweetness, silliness, and a sometimes exasperating degree of cleverness. If you’re lucky enough to be some dog’s special human, you probably know what I’m talking about. We dog people could go on forever about our slobbery companions; I am not ashamed to admit that I have way more photos of Finn that I do of myself (he is much more photogenic). 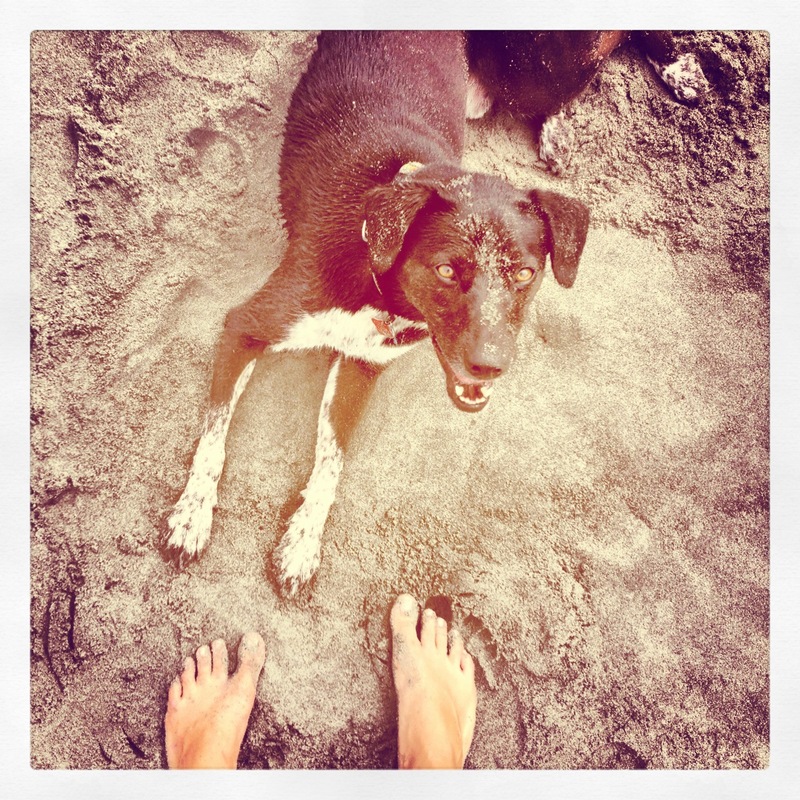 But this post isn’t just about me gushing over what an awesome dog I have (he is awesome though). 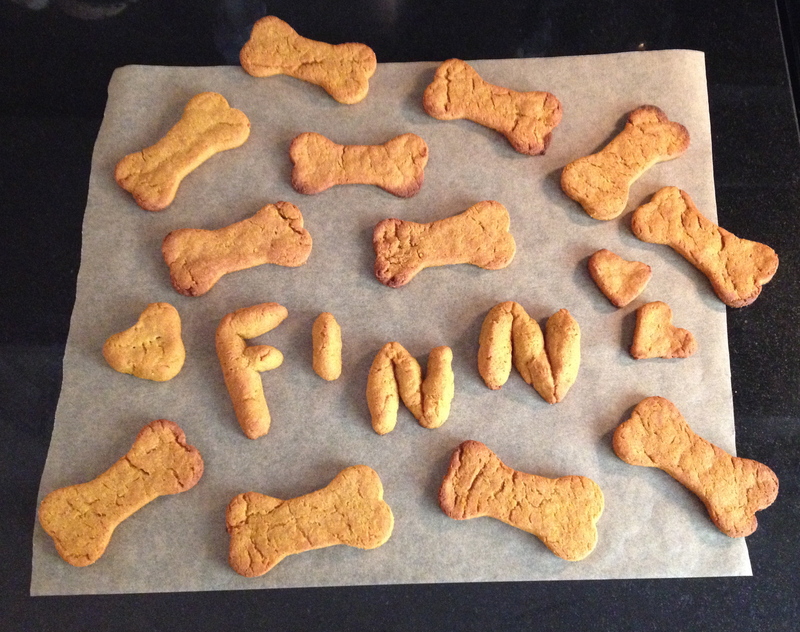 This is about thanking Finn, and all the other pups of this world, for being the best carbon-based life forms ever. Whatever we human beings manage to achieve during our existence on this planet of ours, we will never be as awesome as dogs are. We’re so lucky they like hanging out with us so much. When you’re being thankful for all the good things in your life — family, friends, not being run over by holiday shoppers on various missions to conquer Black Friday like it’s the elusive superboss of Consumerism: The Game — don’t forget about the pup! Bake your little scoundrel some of these treats, and they’ll probably forgive you for spending all of Saturday in line at Target instead of spelunking through the neighborhood’s leaf piles with them. Van Boven’s very well organized book; my not so organized notes. 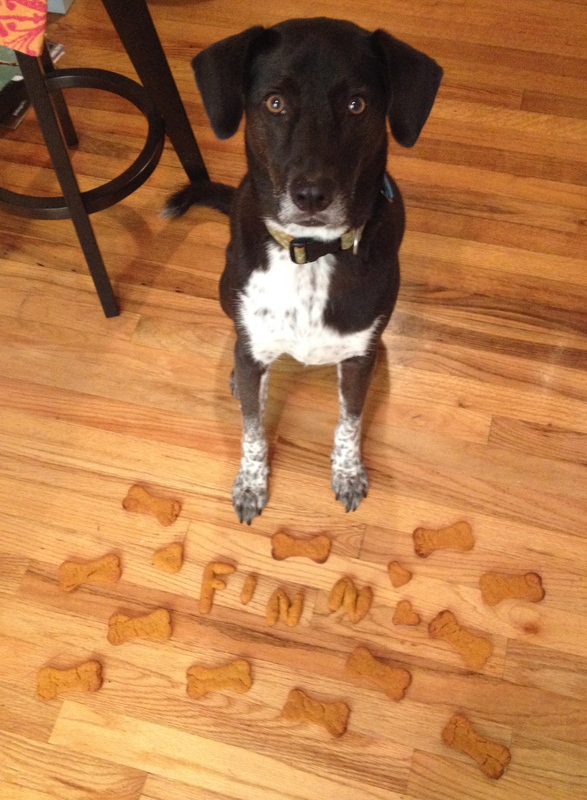 Finn has never done too well with foods and treats filled with grain, which most conventional dog foods use. He is just such a sensitive kid. Luckily, it’s pretty easy to find alternatives to wheat flour and other grain-based ingredients that are typically used in most dog treat recipes. I substituted the whole-wheat flour with potato flour (Bob’s Red Mill makes a good one, available in most health food stores) and the cornstarch with potato starch. If your dog doesn’t have a problem digesting grain, then go ahead and use regular flour and cornstarch. Sweet potatoes take the place of chicken in my version, since I don’t ever buy or cook it. I also used unrefined, virgin coconut oil instead of butter. Coconut oil, when unrefined, has a lot of good stuff in it for humans and dogs alike. I put a tablespoon in Finn’s food at night to help with his itchy, dandruffy skin, and apply it directly to his paw pads when all the hot pavement and salt water starts cracking and irritating his sensitive little feet (the poor guy had mange when his was little, and it was the most persistent on his paws). 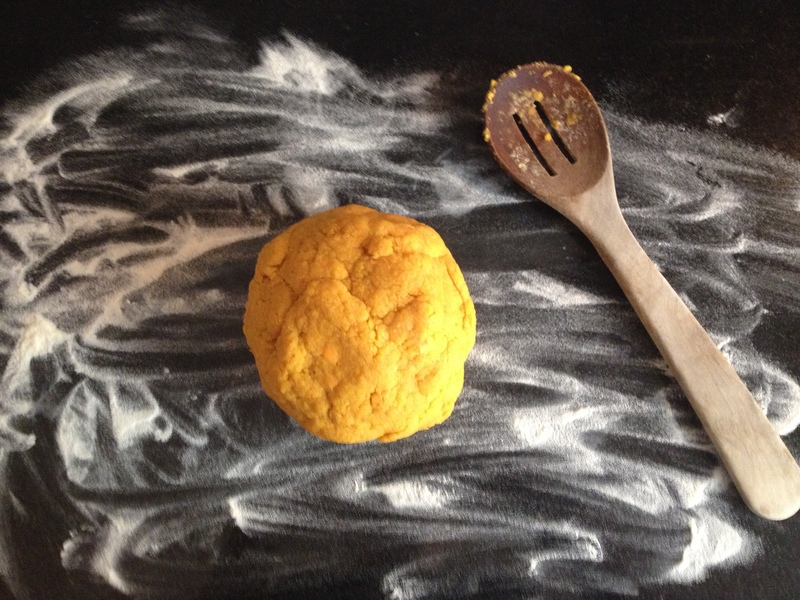 1 medium sweet potato, peeled and chopped. I highly recommend lining a baking sheet with some parchment paper. It keeps the treats from sticking without using butter or sprays, and makes cleanup a lot easier, especially if you are dishwasher-less, like me. Bake for 20 minutes, then check to see how the treats are doing. I ended up leaving mine in another 10 minutes; they should be a golden-brown when they are about done. Allow them to cool before tossing one to your impatient and drooling friend, and store in an airtight container. creative inspiration and credit goes entirely to Van Boven and Verschuren’s photography work for this one. Since this batch did have chicken stock in it, I have no idea what they taste like, but Finn immediately brought his first cookie over to his bagel bed, dug out a safe hole in the bedding, circled around two or three times, and then devoured it. So that’s a good sign. 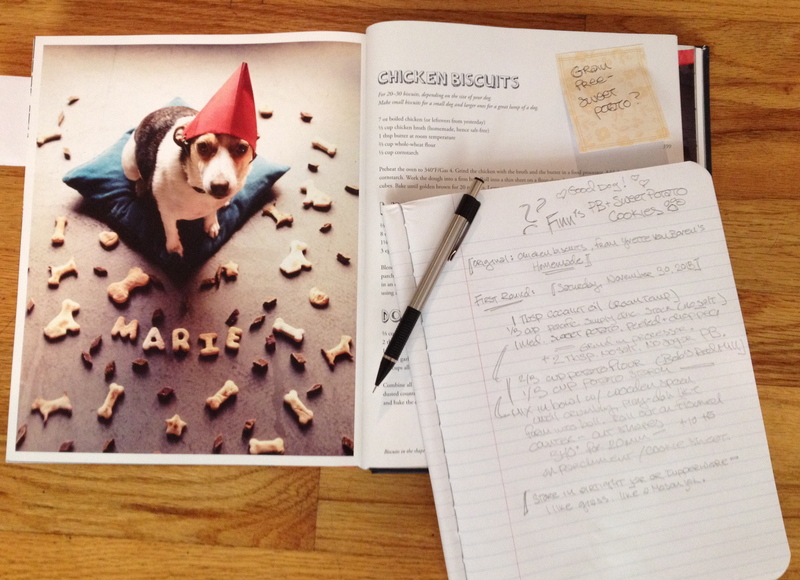 This entry was posted in Dog, Food and tagged dog treats, dogs, grain-free, homemade dog biscuits, Huckleberry Finn, Peanut butter, Sweet potato, Thanksgiving on December 1, 2013 by libbygates.